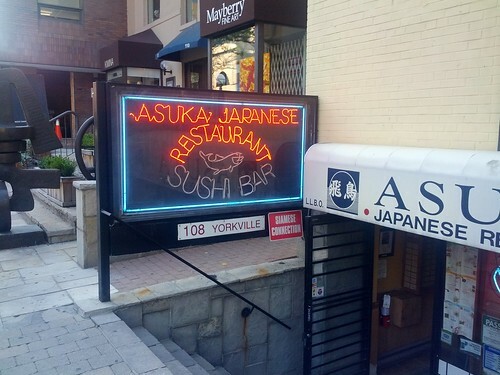 Asuka Japanese Restaurant is located right in the heart of Yorkville, tucked away down a set of stairs. Please read our conversational review, below. 4.0 / 10Everything here tastes the same. Seriously. 4.0 / 10Do you like your spicy rolls non-spicy? Then jump on the Asuka flavour train! The place is kind of hidden but thankfully there’s this huge neon sign. Yep, down a few stairs and into a fairly cramped restaurant that’s broken up into various sections. We got there pretty early, around 5pm and it was empty but people started to flow in pretty steadily. First thing I noticed going through the menu is that there weren’t any “crazy” type rolls. A sharp contrast the previous place [link here] where there were about a million different types of rolls in all shapes and sizes. 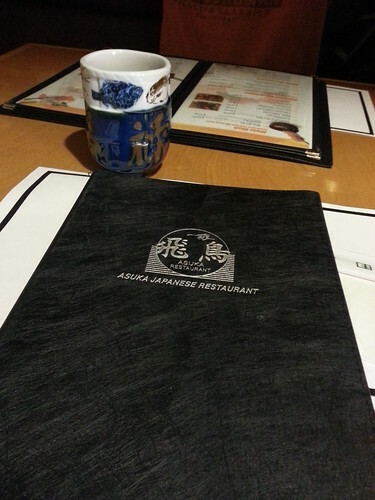 At Asuka, it seems the menu is fairly traditional. Indeed… and that may be a good thing. 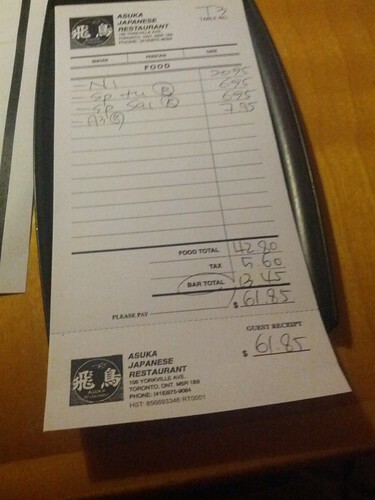 We ordered one of the Sushi Dinners (“Asuka Sushi” – 13 pieces of sushi and 3 pieces of sushi roll for $20.95 – comes with a soup, salad and fresh fruit) and added on a couple of rolls (Spicy Sake Maki – Salmon, and Spicy Tuna Maki — $6.95 each) for good measure. All the dishes came out one after another and pretty fast too. Guess we got our order in quick when the sushi chefs weren’t too busy. All the dishes looked pretty good and fresh at first glance. The spicy tuna rolls were okay but didn’t have much spice or flavour to them. 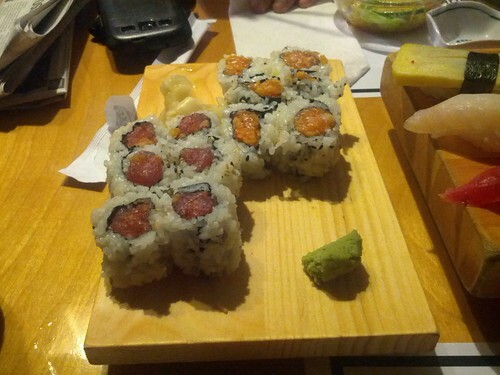 In fact both the spicy tuna and spicy salmon rolls tasted the same to me. 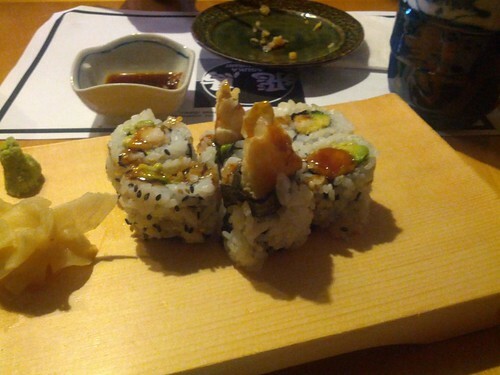 Yeah, one of my favourite things to get when going for sushi is spicy tuna/salmon/scallop rolls. I have to say that Asuka was a huge disappointment on this front. There was pretty much zero spice – and, agreed – they basically tasted the same. In fact almost everything we ordered from the first round tasted the same to me. I’m not sure how that’s possible but I felt everything was kind of bland. Nothing stood out. 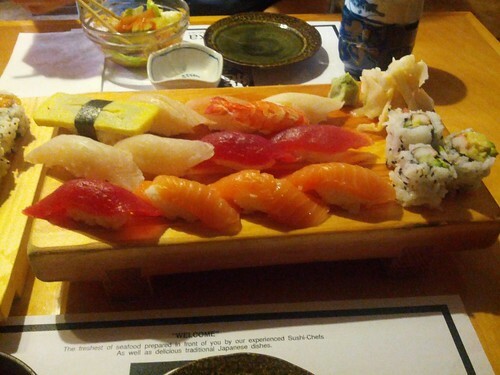 Moving on to the Sushi dinner…the fish looked fresh and a bit more in line with traditional sushi places. Unfortunately they didn’t taste all that fresh. 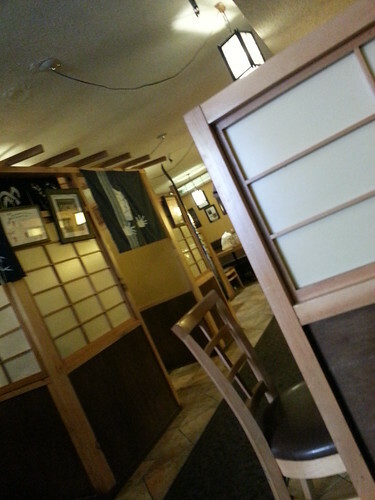 It wasn’t that it was good or bad but eating the sushi I was indifferent. It took me a while to figure out in words what the problem was. There just wasn’t anything special about it and all the fish just tasted the exact same to me. No flavour to them. Very disappointing. Yep, agreed. It was very odd, I must say. So odd that I wanted to leave with a better, uhh, taste in my mouth. I ordered up the dynamite rolls. 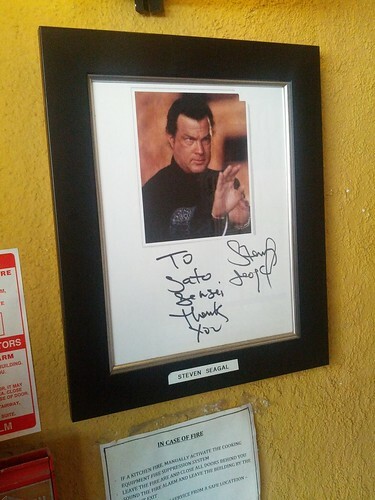 At least there’s Steven Segal to say hi and goodbye to you. Agreed, the Dynamite rolls did give Asuka a few points near the end. Not bad. Overall though, you really have no reason to hit up Asuka. There are better options not that far away. 4/10.